In last month’s Photo Essay I reviewed the subject of unnecessary bonding. This month I’ll cover bonding system maintenance. Bonding systems serve several roles. For underwater metals like seacocks, struts, shaft and rudder logs and rudders (and to some extent prop shafts and props when using a high quality shaft brush), they afford protection from both galvanic and stray current corrosion. While it’s no guarantee, a solid bonding system can also reduce the effects of a direct or nearby lightning strike. However, bonding systems are of no use if they are designed or installed improperly, or ill-maintained. In these cases they provide nothing more than a false sense of security. Because galvanic corrosion voltage is so low, it’s measured in millivolts or thousandths of a volt, American Boat and Yacht Council guidelines set a very high bar for bonding systems, calling for no more than one ohm of resistance between any protected metal and the system’s (zinc, aluminum or magnesium) anodes. If you aren’t familiar with multimeter use and resistance measurements, one ohm represents extremely low resistance. How low? Imagine you were pulled over and cited for doing a tenth of a mile an hour over a 55 mile an hour speed limit, that low. A loose or even slightly corroded connection will almost certainly exceed this threshold. 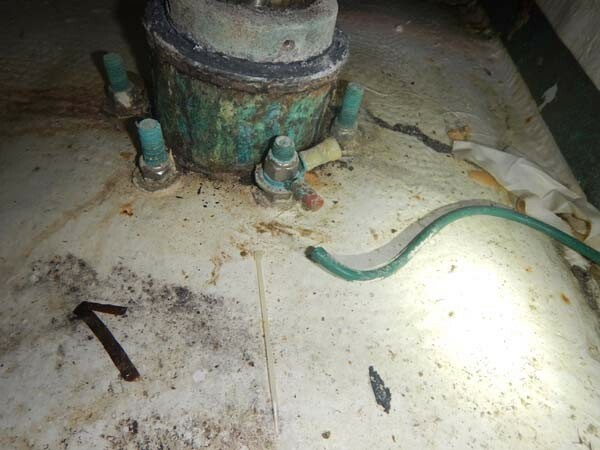 Because most boding system connections live in bilge and lazarette areas, corrosion is their ever-present nemesis. While heat-shrink solderless terminals aren’t mandatory, they are beneficial in this application. At the very least, connections should utilize high quality, two stage nylon-insulated terminals, conductant or dielectric grease, and corrosion inhibitor. If you are repairing corroded connections, clean the connection surface with a Scotch-Brite pad and solvent such as CRC Electric Parts Cleaner. If the connection is made to a moving part, such as a rudder, two stage heat shrink terminals become more important for their strain relief properties, along with an extra length of wire that’s been coiled around a screw driver shank, macaroni-like, to make a movement-absorbing “spring”. The example shown here involves the bonding system for a rudder log. Two “vacant” solderless terminals can be seen, along with a wire that is adrift, affording this part no corrosion protection from the vessel’s bonding system. For more on bonding systems see https://stevedmarineconsulting.com/wp-content/uploads/2014/03/BondingSystems138_05.pdf And for more on making reliable solderless terminal connections see https://stevedmarineconsulting.com/crimping-etiquette/. I’m a Marine Electrician, I studied Marine Systems at The Landing School and I have multiple ABYC certifications including Marine Electrical and I have now been doing electrical work for about 8 years. I have sufficient knowledge to wire anything to code yet I still struggle in some circumstances to understand why AC grounding, DC negative and Bonding Systems are all tied together. You have written some good articles over the years about marine electrical systems and I’m hoping to petition you for another one that would cover this issue in sufficient detail with real life examples of the effects of connections being there or not. It is the nuances of the many possible interactions that perplexes me. I understand the purposes of each system respectively but sometimes their being interconnected seems more likely to cause problems than prevent them. Perhaps you already have an in depth article on this that I haven’t found yet. The relationship between bonding, AC safety ground, DC grounding and DC negative can appear complex, I agree. However, generally speaking it need not be. First and foremost, these systems, and the need for them to remain common to each other, is required for the best possible protection against electrocution. Bonding/grounding metallic gear makes electrocution far less likely; if any of these items, engine block, tank etc., becomes energized with AC voltage, it will be safely shunted to ground (and its source), thereby tripping the circuit breaker, rendering it safe. In order for this to work, all bonded/grounded gear must be common with the AC safety ground. Beyond that, bonding reduces the likelihood of both galvanic and stray current corrosion (in the latter case, this is why the bonding system must be common with the DC negative. Finally, if these systems remain disparate, the risk of developing potential between them, or side flashing in the event of a lightning strike, increases significantly. You may also find these article links useful. The electrical problem that I have is AC current from neutral to ground. This is determined by measuring with a clamp-on ammeter on the shore power cable with all breakers off from the shore box to the boat’s distribution panel. It measures about .6 amp and connecting a big zinc in the water to the boat’s ground draws away about .2 amp. It appears that some unit has leakage (neutral to ground) but I don’t know where to start. What are the usual suspects? Battery charger? Refrigerator? Air conditioner? What could raise the shore power neutral potential to ground? Bill: These problems are tough, and potentially dangerous to diagnose from afar. Based on your description, what you are reporting may not be indicative of a fault. It’s not unusual to see unbalanced AC current flow on a shore cord, and if you are seeing this with all breakers off, then it’s almost certainly emanating from a nearby vessel, and using your vessel’s bonding system, which is connected to the AC safety ground, which in turn is connected to the safety ground ashore via the shore cord. If you suspect there’s a problem don’t take a chance, call in an ABYC certified marine electrician to confirm the system is ABYC compliant. Finally, you might find this article helpful. Thanks for being here with the ability to ask esoteric questions. We’ve owner our boat for 5 years and during that time we hadn’t packed the rudder glands. Not sure when last it was done with the previous and only other owner. Some trial and error got me to the right size packing material, I noticed there were 2 different types and will address this a little later, and by virtue of reading how to place the packing I was able to do the job. My first question is, when tightening the first nut it occurred to me that the second nut could be a lock nut. I know they have been used in the aircraft industry for years where there is a fair amount of vibration. So, I placed a lock nut as the second nut. I was tempted to use just the lock nut but thought I’d query you before I did that. My second question is about the 2 different type of packing material. The first seems to be WPT Graphtex Ultra (GTU) Flax Shaft Packing and the second seems to be WPT Teflon PTFE Flax Shaft Packing. The first is black in color while the second is white. Can you explain which is better and if there is a difference for each use? I removed all of the previous packing on one side and used the black material and on the other side I added 2 courses of the white without any removal of previous material. We splash today and will be keeping a very close eye on the 2 glands for severe water intrusion. As always, appreciate any info you can provide. BTW, I have my wrenches handy for any last minute tightening. There is a chart for packing material diameter, it’s a function of shaft diameter, available on Buck Algonquin’s website. Nylon lock nuts are commonly used on stuffing boxes, and strictly speaking you wouldn’t need a second nut, however, I’d feel better with twin nuts, even if one is of the locking variety. Based on ABYC standard E-2, under no circumstances should graphite ever be used in a marine shafting application. Graphite is a highly noble or cathodic metal, which means shafts are less noble, and thus anodic. In short, graphite, in contact with stainless steel alloy shafts, in the presence of water, will almost certainly lead to corrosion of the shaft. Having said that, the GTU packing material, made using Gore fibers and graphite, I assume somehow seemingly addresses this issue, however, I’m unsure how that’s accomplished. I contacted the manufacturer and requested details on two occasions in the past, however, I’ve received no response. I wouldn’t use a graphite-based packing, especially on a rudder shaft, it’s unnecessary as the friction is so low. With one caveat, Teflon-based packing is common and perfectly safe for use in marine shafting systems, I’ve used it for years. In some cases it can actually work too well, starving the shaft of cooling and lubricating water. In rudder applications it’s not an issue because, once again, little friction and no heat are developed. In propeller shafts it should be used cautiously; my practice is to use one wrap of Teflon surrounded by two wraps of conventional flax. The best indication of proper packing adjustment, for propeller shafts, is temperature. Ideally, the stuffing box should be no more than 30°- 40° F above seawater temperature, regardless of drip rate (the less leakage the better, provided the stuffing box remains comparatively cool). For rudder shafts, packing should be tight enough to exclude water leakage; temperature is not an issue. For more on packing stuffing boxes see, https://stevedmarineconsulting.com/conventional-wisdom-for-conventional-stuffing-boxes/. For producing a LOT of electricity, why wouldn’t a pto-powered hydraulic pump linked to a hydraulic motor directly attached to the alternator shaft work more reliably than any belt? On the face of it that seems like a great approach, and it was used by some builders for a period of time, including Nordhavn. I haven’t seen a new installation in years. In fact it’s pretty darn inefficient, turning rotational energy from the engine into hydraulic fluid pressure, which is then converted back into rotational energy to turn an alternator, induces significant loss and inefficiency, on the order of 10% to 15%. Additionally, it’s often difficult to turn an alternator fast enough using a hydraulic pump; that speed is needed not only to produce adequate energy, it’s also used to operate the alternator’s fan for cooling purposes. In their heyday it was not unheard of for hydraulic alternators to overheat and even catch fire. Bottom line, you can do this and some folks use these systems, however, the fuel use is, in my experience, always higher per amp-hour produced when compared to a belt-driven alternator. The trick would be, if you could find it, a gear-driven alternator like the ones used by some United Parcel Service Trucks. Please also view our Upcoming Events webpage. For more photo albums, visit SDMC's Photo Gallery. All Photos, Text and Website Copyright © 2007-2018 SDMC Inc.